The Sony Xperia M4 Aqua comes with Google Chrome as the default web browser out of box instead of the generic Android browser. While the minimalist interface hasn't changed since Chrome launched on Android, the browser is being constantly refined by Google, and this has resulted in one of the smoothest and most powerful browsing experiences we've encountered on a mobile. 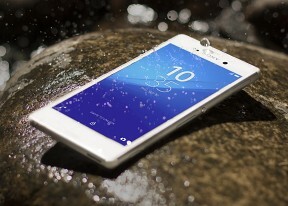 Sony Xperia M4 Aqua also features the Office Suite 8, which allows for creating, viewing and editing office files (docs, xls, ppt), and it can also read PDFs. We were quite happy to see that Sony has finally retired the Sony Select App. It was begging to be deprecated for quite some time now, as What's New offers the same features and more. The Xperia Lounge is a sort of custom-tailored deal and promotion aggregator. It gives users the opportunity to participate in various Sony promotions and win prizes. Another interesting little feature is the Movie Creator. Its name is pretty much says it all. Oddly enough, Sony has decided not to bundle either the Sony PlayStation app or PartyShare, even though they we present on the low-end Xperia E4 and E4g.